Today for many of our sisters and brothers from the eastern hemisphere is the Lunar New Year celebration. 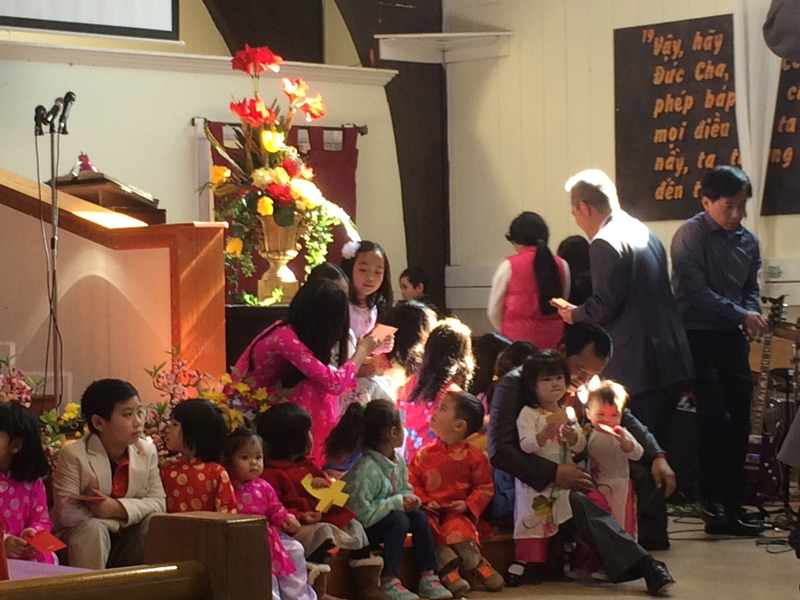 I was blessed to be invited to a celebration yesterday by one of our students, Loann Nguyen, to her church, Faith Vietnamese Baptist Church, and was struck by the intergenerational activities that were a part of their celebration of this holiday. After the service ended steamed buns and bottles of water were passed out to members and visitors alike for all ages. 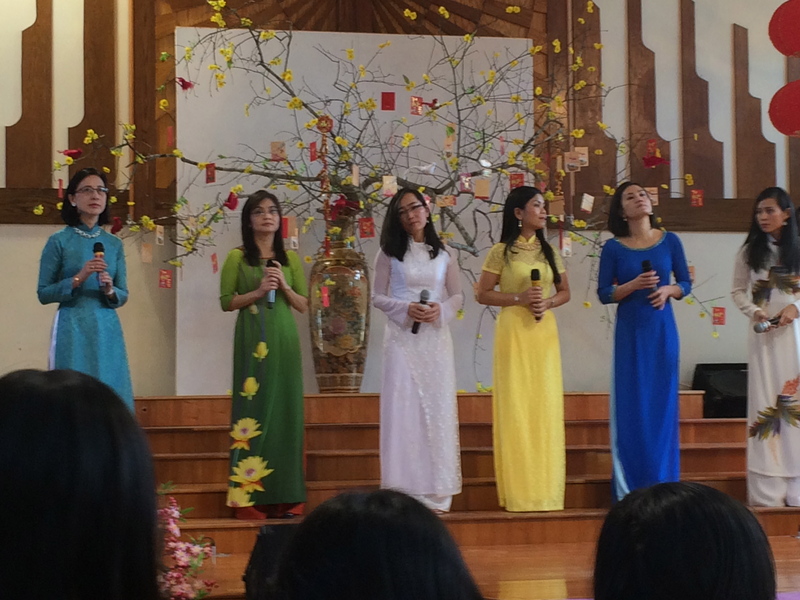 Many were in traditional Vietnamese attire, old and young alike. A group of young men and women took the stage to sing in the celebration. Their song ended with fire crackers lit outside the side door of the sanctuary. Two young adults stood in the chancel area to introduce the contributions of songs, dances, and dramatic skits that would be presented on the various themes connected with the start of another year. Many of these connected the coming of spring with relationship to God. Early in the program the children from toddlers through 5th grade were called to the front and the elders of the church gave them “lucky money” from the church for their schooling and other needs. The dramatic skit also had an intergenerational focus as a mother dealt with two sons–one who was happy playing with simple things and one who wanted many material things like computers, new name brand shoes… The latter leaves home on Lunar New Year to seek his fortune. The mother bemoans his loss each subsequent Lunar New Year and he finally returns having found out that the seeking of things was not what really mattered, but family was. The skit ends with the reunited family headed to church for the Lunar New Year’s celebration–a Prodigal Son story in a new context. 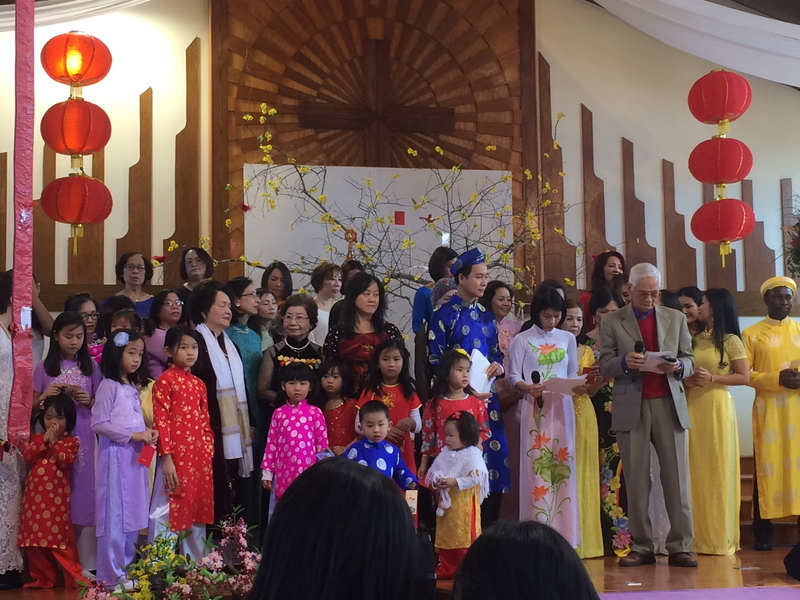 The last intergenerational celebration I viewed was a fashion show for all dressed in traditional Vietnamese dress. Old and young paraded to the chancel area and out on the short runway to show their beautiful clothes. Some came in family groups, others in friendship groups. This time was closed in prayer by an elder of the church. What struck me was how effortless all of this was to find ways to bring together the generations in faith and fun. Happy Lunar New Year and God’s blessings for the future!